Agatha Christie was a prolific and extremely popular British author and playwright best known for her work in the murder mystery genre. From her first novel in 1920, The Mysterious Affair at Styles, to the reprints of her novels that still appear today, some 30 years after her death, Agatha Christie's works have enjoyed unparalleled success. But while Christie and her favorite characters, Hercule Poirot and Miss Marple, have become icons of "who dunnit" detective fiction, the scope of Christie's popularity is such that that sales of her books have not only surpassed that of any other mystery writer, but of all other writers of any genre. Not even William Shakespeare has been so widely read. In fact, according to the Guinness Book of World Records over 2 billion copies of her books have sold and her works have been translated into more than 100 languages. Only the Christian Bible has outstripped her in readership. Many of Christie's works have been translated into film, most notably Murder on the Orient Express (1974). Her short stories, plays, and novels have also been adapted to television, radio, and at least one video game (And Then There Were None, 2005). In addition Christie boasts the longest running play in the world: The Mousetrap, which she originally wrote as a birthday gift for Queen Mary. Christie received numerous honors during her lifetime including the Mystery Writers of America’s Grand Master Award (1955) and the order of Dame Commander of the British Empire (1971). In addition to her more famous mysteries, Christie wrote some lesser known romantic novels under the pen name Mary Westmacott. Agatha Christie was born Agatha Mary Clarissa Miller on September 15, 1890 in Torquay, England. Her father was an American citizen, of modest private income, who home schooled her in mathematics. But when young Agatha was 11 years old he died, and she thereafter began attending regular classes in arithmetic and other subjects. She was an avid reader as well and soon became a great fan of Sir Arthur Conan Doyle, especially his Sherlock Holmes mystery stories. Her love of writing surfaced early as well, nurtured both by her mother and by neighboring novelist Eden Philpotts (best known for his Dartmoor series). Of this period Agatha Christie remarked, "For some years I enjoyed myself very much writing stories of unrelieved gloom where most of the characters died." Music and dance had always been an important part of her curriculum. So when Agatha's mother sent her off to Paris a few years later, for further schooling, it was with the hope that Agatha might one day emerge as an opera star. But although she did well in singing and music lessons Agatha developed terrible stage fright, making a career involving any kind of public performance utterly out of the question. After graduation Agatha and her mother embarked on an exciting 3 month tour of Egypt, a very fashionable "wintering" spot for English society of that period. But while other English folk went for the novelty and the chic, young Agatha felt in love with the history and with Middle Eastern ambience. The romance and the mystery of other cultures and of great civilizations long gone intrigued her greatly and became fuel a number of her later books, as well as a life long love of archaeology. But all that was in the distant future. When she returned to England Agatha found romance and adventure of a different kind. She met and married Archibald Christie, a handsome young Lieutenant in the Royal Field Artillery. That same year, 1914, World War I began. And like many other patriotic young women the 24 year old Agatha began volunteering her time for the war effort. She became a nurse at a Red Cross Hospital in Torquay, and eventually she took a post in the dispensary. There she gained an intimate knowledge of pharmaceutical drugs and their preparation and uses -- including their lethal dosages. Meanwhile her love of writing and mysteries still flourished, and she began to think about writing her own novel. In 1916, egged on by her sister Madge, she decided to have a go at it. Setting the interruptions of daily life aside, she checked into the Moorland Hotel in Dartmoor. In just three weeks she managed to crank out her first novel, The Mysterious Affair at Styles. The novel debuted her now famous Belgian detective Hercule Poirot, the quirky yet logical little Poirot who would eventually appear in 39 novels, including his 1975 swan song, Curtain, published shortly before Christie's death. But although finished quickly, the book took nearly four years to find publication. But once the reading public had gotten a taste of Agatha Christie's work, her success as an author was assured. Her second book The Secret Adversary soon followed in 1922, starring lesser known characters Tommy and Tuppence. (Miss Marple would not appear until 1930.) And soon she was publishing at least one book per year -- with nearly everything she produced selling astonishingly well. But life on the home front meanwhile was not so successful. Despite the birth of daughter Rosalind in 1919 and their mutual economic success, the Christies were drifting apart. Eventually, in 1926, Archie admitted he had a mistress and asked for a divorce. The highly sensitive Agatha was crushed. But what followed immediately after has haunted the legend of the great writer ever since. On the evening of Friday, December 3, 1926, Agatha Christie went upstairs to kiss her daughter goodnight. Then, at 9:45 p.m., she got into car and drove away. Later the vehicle was found abandoned several miles from home, with many of Agatha’s personal belongings strewn about inside. There was no sign of Agatha herself however. Immediately a huge search was mounted, and the case attracted tremendous attention from the media as well as various public figures, including the Home Secretary. As if the line between mystery novel and reality was not blurry enough, Sir Arthur Conan Doyle was sought out to consult on the case as was mystery writer and Dorothy L. Sayers. Agatha’s husband Archie meanwhile, who had been away for the weekend with his girlfriend, became the object of tremendous scorn and suspicion, with members of the public alternately conjecturing that he had done his wife in, or driven her to suicide. But 11 days later Agatha Christie was found, alive, at the Harrogate Hydropathic Hotel. Most curious of all, she had registered herself under a name patterned after her husband's mistress. According to a public statements made by police and family, Agatha was allegedly suffering from amnesia. Agatha herself never commented publicly on the event, and nowhere in her autobiographies is it mentioned. Christie enthusiasts and biographers continue to puzzle over the incident therefore. Was it a publicity stunt to raise book sales, as the police suspected? Or perhaps it was an attempt to embarrass her husband and ruin his weekend tryst with mistress Nancy Neele, as suggested by biographer Jared Cade ( Agatha Christie and the Eleven Missing Days, 1999). There are even those who claim her tale of amnesiac confusion was legitimate, that she’d had a particularly severe nervous breakdown (Agatha Christie: The Finished Portrait, 2006, Dr. Andrew Norman). A fictionalized 1979 film treatment of the subject, Agatha, starring Dustin Hoffman and Vanessa Redgrave even portrayed a confused Christie held virtual prisoner at Harrogate, receiving shock treatments to alter her mental state. Although speculation continues, many believe her novel Unfinished Portrait (1934), written as Mary Westmacott, gives clues to the emotional turmoil she was experiencing prior to her disappearance. In it a woman writer, remarkably similar to the real life Christie, is driven to the edge of suicide by the shock of her husband’s demand for divorce. In any event, despite remaining together for a time after the scandal, the Christies ultimately divorced in 1928. Several months later Agatha decided to go on a holiday, someplace exotic and foreign. She ended up aboard the Orient Express, headed for the Middle East. But even though the train ride provided fodder and inspiration for her later book, Murder on the Orient Express (1934), her final destination proved dreadfully boring. Arriving at last in Baghdad, Christie soon found herself bogged down in polite English society, and all usual accouterments. She felt that if all she had wanted was to do was play tennis and attend tea parties she could have stayed at home. Christie was aware however that some exciting archaeological work was being done farther south in Iraq, at the site of the biblical city of Ur. And she realized she could escape her implacably English hosts by arranging a visit to the dig site. As it turned out the wife of the chief archaeologist on site was a big fan of Christie's and an extended stay was easy to arrange. There at last she immersed herself in the exotic foreign world she had come to explore -- strange foods, customs, the bustle of native workers. But as it turned out, watching the ancient past emerge from the sands had a romance all its own. And the intellectual work of archaeology, figuring out the past from clues left behind, was a great deal like detective work. So, although she had to return to England, she eagerly accepted an invitation to return again the following year. When she did, she was assigned a handsome young archaeologist, Max Mallowan, to show her around and explain what had been learned during the year’s excavation. Agatha enjoyed his company as much as she did the tour itself. But of course she was certain he would never be interested in an "old lady" like herself, 14 years his senior. But when a family emergency called Agatha back to England, Max insisted on accompanying her. Six months later they were married. It proved to be the beginning of a life of mutual respect, support, and adventuring with Agatha accompanying Max into the field for excavations as often as possible. She even became the expedition photographer and was a crack hand at cleaning and restoring artifacts. What's more she loved reconstructing fragments of pottery and other artifacts, likening it to doing a jigsaw puzzle. According to Max, she had a meticulous manner, a keen eye, and seemingly endless patience. Meanwhile she continued to write her novels, with many of her stories inspired by the settings and characters she’d encountered on their travels. The hefty earnings from her books meant she and Max were never short of revenue for their expeditions or any of Max’s other academic forays. But by 1957 Agatha found it more difficult to manage camp life, especially in the rainy season. Indeed she was so plagued by illness that year Max decided to call it quits. They retired from Nimrud and returned to England, where they busied themselves with writing and other projects. In 1968 Max was knighted for services to archaeology, and he was made a trustee of the British Museum in 1973. 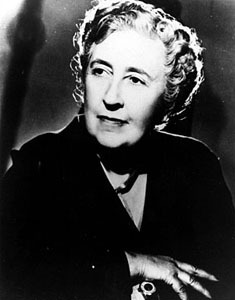 Agatha, in the meantime, was named the world's best-selling author in the English language (UNESCO, 1961), and was created a Dame Commander of the British Empire (1971). She continued writing of course, and she became increasingly involved with the theater and film. Before long any play with her name attached became an instant sensation. But on January 12, 1976, Agatha Christie died, following a short illness.She was 86 years old. Max's memoirs, published the following year, cited his feelings of emptiness after 45 years of a loving and creative partnership with Agatha. Nonetheless he did remarry however, in September of 1977 to Barbara Parker, a long time friend and work associate from the excavation at Nimrud. Parker was one of a handful of women with whom he is rumored to have had an affair. Less than a year later, on August 19, 1978, Mallowan himself died. Despite the fact that Max Mallowan was considered one of the premier anthropologists of his day, it is his wife, Agatha Christie Mallowan, which the public best remembers. Although as private, self-effacing and polite as her favorite character, Miss Marple, Dame Agatha made it clear to her readers that a shrewd and creative intelligence could be a thoroughly feminine virtue.